The U. S. Playing Card has produced a deck of cards a 1/16" inch shorter. Until now these kind of decks were cut handcrafted by specialized companies. 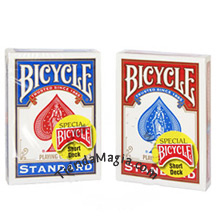 Now we can rely on the perfection of the manufacturer of the Bicycle cards. • You now have 54 short cards with perfect corners. • Use them as "key-card" or in a routine that uses the principle of the Svengali.